For Kids, Self-Control Factors Into Future Success Social scientists say three things matter for success in life: IQ, family's socioeconomic status and one thing that's easy to influence: self-control. A child's self-control in preschool helps predict possible health, substance abuse and financial problems later in life, researchers found. "Children who had the greatest self-control in primary school and preschool ages were most likely to have fewer health problems when they reached their 30s," says Terrie Moffitt, a professor of psychology at Duke University and King's College London. Moffitt and a team of researchers studied a group of 1,000 people born in New Zealand in 1972 and 1973, tracking them from birth to age 32. The new study, published in the Proceedings of the National Academy of Sciences, is the best evidence yet on the payoff for learning self-discipline early on. The researchers define self-control as having skills like conscientiousness, self-discipline and perseverance, as well as being able to consider the consequences of actions in making decisions. The children who struggled with self-control as preschoolers were three times as likely to have problems as young adults. They were more prone to have a criminal record; more likely to be poor or have financial problems; and they were more likely to be single parents. This study doesn't prove that the lack of self-control in childhood caused these problems, but the large size of the study, and the fact that it followed one group of people over many years, makes a good case for an effect. Economists and public health officials want to know whether teaching self-control could improve a population's physical and financial health and reduce crime. Three factors appear to be key to a person's success in life: intelligence, family's socioeconomic status and self-control. Moffitt's study found that self-control predicted adult success, even after accounting for the participants' differences in social status and IQ. Cathie Morton, a teacher at the Clara Barton Center for Children, leads the kids in a clapping exercise to signal that it is time to shift gears and start cleaning up. 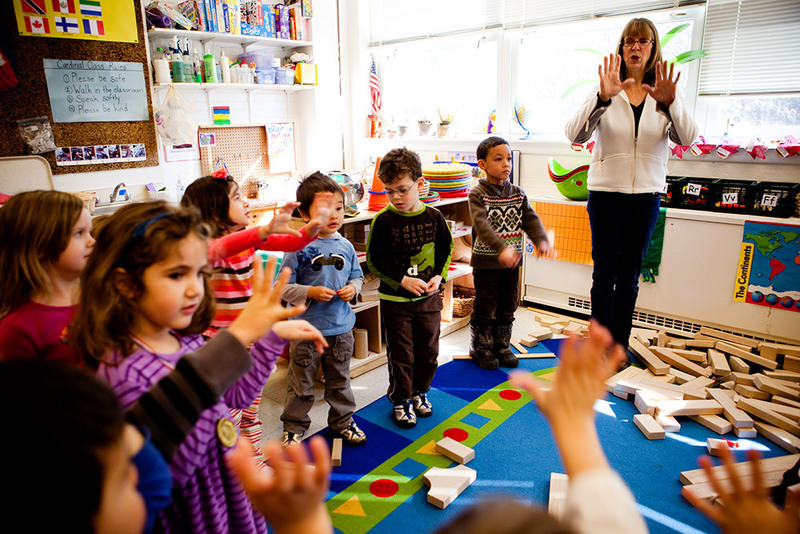 Teaching self-control has become a big focus for early childhood education. At the Clara Barton Center for Children in Cabin John, Md., it starts with expecting a 4-year-old to hang up her coat without being asked. Director Linda Owen says the children are expected to be responsible for a series of actions when they arrive at school each morning, without help from Mom and Dad. The children sign in, put away their lunches, hang up their own clothes, wash their hands before they can play, and then choose activities in the classroom. "All those things help with self-management," Owen says. 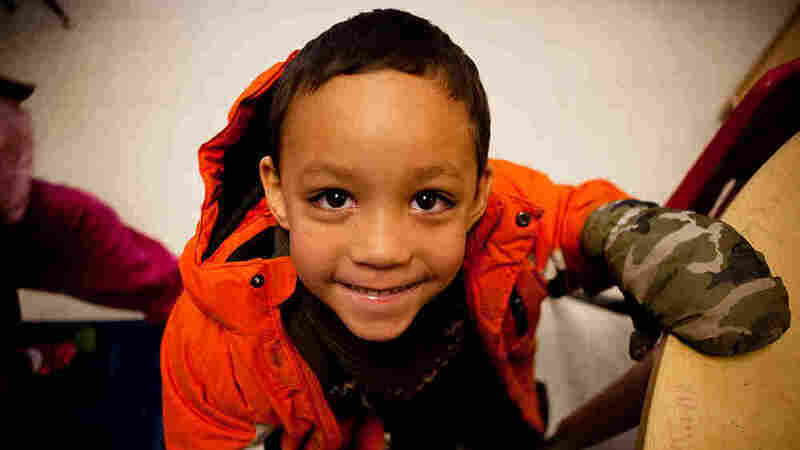 Of course, not all 4-year-olds are ready to manage that, so the classroom is loaded with cues and clues to help the preschoolers make their own decisions and be responsible. Liya Pomfret and Rowan Miller demonstrate how they use the "solutions kit" to resolve conflicts. A series of seven photos over the sink shows the correct sequence for hand washing. 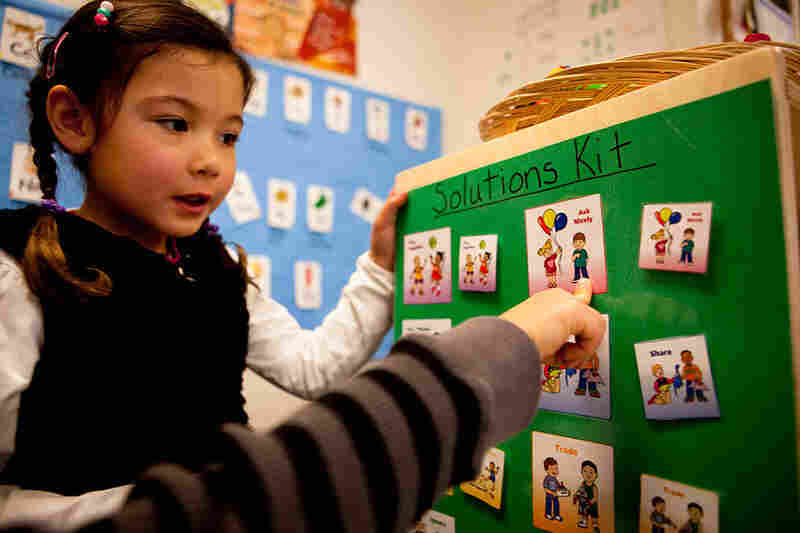 A "solutions kit" poster shows techniques the children can use to resolve disagreements themselves, like sharing or playing with another toy. The two teachers give the children multiple cues when it's time to clean up: Lights flash, a bell rings and the children clap and count to 100. That makes it easier to switch gears without a meltdown. 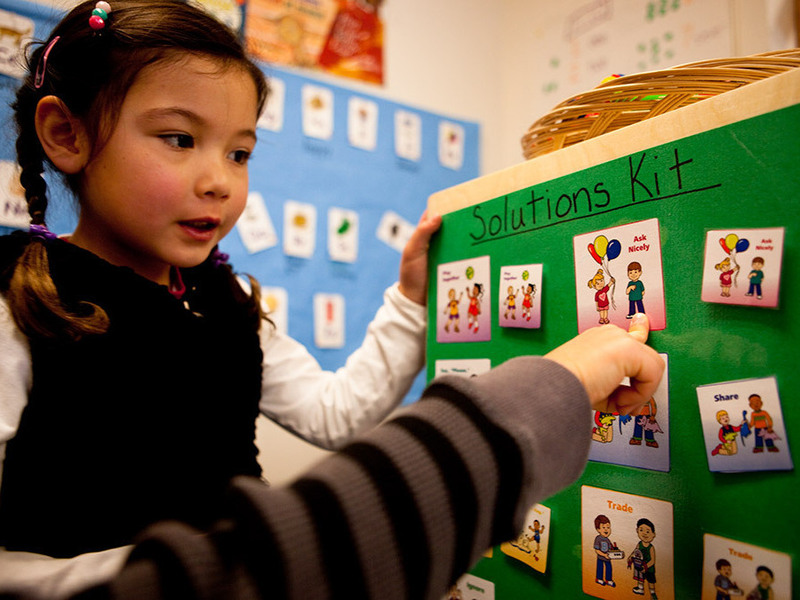 If a child has problems with self-management, the teachers make a customized "visual cue" card, with photos of the four play choices in the room, to make the decision easier. And teachers Cathie Morton and Daniela Capbert don't just supervise — they're in the thick of the children's play so that when the inevitable conflicts arise, they can redirect the children into other activities or help them talk through their feelings. When things do go wrong, there are consequences. Timeouts and apologies don't mean much to children at this age, Owen says, so the teachers try to match consequences to the deed. When one of the children accidentally knocks over a 2-foot-tall tower of blocks that several children had spent half the morning building, the teachers ask the builders what should happen next. "Help fix it," one boy says. And, with a little prompting from the adults, they all pitch in and rebuild. Parents can help their children learn self-control. Mary Alvord is a clinical psychologist in Silver Spring, Md., whose new book, Resilience Builder Program for Children and Adolescents, teaches self-control strategies. Take small steps, she says. For example, preschoolers can learn that they don't always get what they want immediately; they may need to wait for that treat. "I call it Grandma's rule," Alvord says. "No dessert until you finish your dinner." Parents can help teenagers learn self-control by making sure the family has clear rules for things like curfew or finishing homework before they have screen time. Teenager who have problems with impulsivity may benefit from special driving classes that let them practice controlling the car in difficult conditions on a racetrack. For all teens, clear rules such as curfews help them regulate themselves. Though self-control can be improved throughout life, Moffitt says the earlier children can learn these skills of self-discipline and perseverance, the better. "The later you wait in life to try to learn self-control skills, the more problems you have to reverse and overcome." All the more reason to start picking up blocks when you're very young.